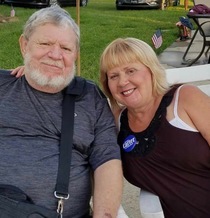 Daniel “Danny” Van Hamlett, died peacefully Friday, September 21, 2018 at Duke University Medical Center. Born in Fort Knox, Kentucky, son of the late William Allen Hamlett, and Catherine Clayton Hamlett, who survives, of Yanceyville; in addition to his father he was preceded in death by the love of his life, his wife of over 35 years, Tina Payne Hamlett. Mr. Hamlett was the owner and operator, alongside his brother and best friend Dink Hamlett, of Hamlett Carpet Service. He was of the Christian faith. Mr. Hamlett was a member of Skinnin Shed Hunting Club, known as Burhead. He was an avid hunter and fisherman. To say the least he was a loving father and grandfather. He enjoyed watching the Atlanta Braves with his brother. He also loved what he called the farm life, and enjoyed raising his cattle. Surviving in addition to his mother are his two daughters whom he adored Ashley Fazzino and husband Steven, of Burlington and Danielle Hamlett of Burlington; one brother Dink Hamlett of Yanceyville, three sisters Kathy Nicholson and Phil, Connie Rice and Scotty, Laurie Solomon and Darrell. Two granddaughters, that were the apples of his eye, Analeigh Fazzino and Shilah Rivers. Memorial service to be held Saturday, September 29th from 4:00 pm until 6:00 pm at his home. The family will receive friends any time at the home of Catherine Hamlett. The family asks that instead of flowers memorials be made to his granddaughters Analeigh Fazzino and Shilah Rivers. Harrelson Funeral Services of Yanceyville, NC has the privilege of serving the Hamlett Family. Long time friend. Hate to hear he’s gone. Prayers for all the family. Prayers to the family. I remember as a child coming to the house playing with chickens. Im glad there is no more pain and you get to be with your wife. Greatly will be missed. Dear family, in this time of sorrow, my condolences are with you. And may these beautiful words from the Scriptures help you to endure, for Jehovah is the God of all comfort. “Do not be anxious.....but in everything by prayer and supplication along with thanksgiving, let your petitions be made known to God; and the peace of God that surpasses all understanding will guard your hearts and your mental powers by means of Christ Jesus.” Isaiah 26:4; 2 Corinthians 1:3-4; Philippians 4:6-7 NWT. Peace and many happy memories of Mr. Hamlett be with you.